Bathroom weighing scales have come a long way since their first analog model. I remember the simple mechanical scale at my parents place - as a kid I used to love hopping onto the scale and then checking the dial reading. Today we have digital bathroom weighing scales that not only measure weight but also calculate several other readings like muscle mass, body fat percentage, water ratio and BMI. 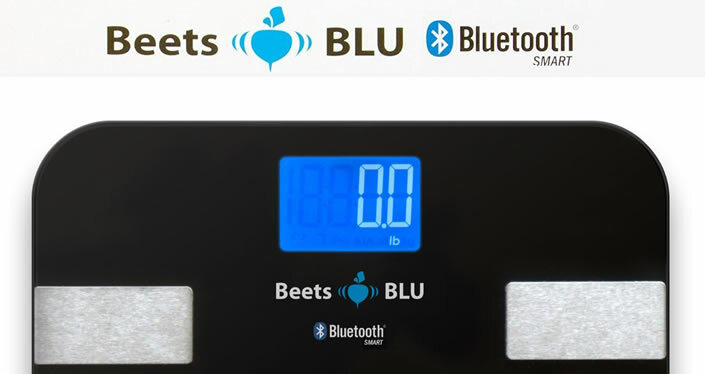 The Beets BLU Bluetooth bathroom scale not only does all this but also connects to mobile via Bluetooth Smart (4.0) and uploads all your information to a native mobile application for Android and iOS, with saving history. This allows you to analyse the data and choose an appropriate way to track your weight loss journey. The set up is a very simple process. Insert the batteries ( 4 x AAA) into the scale and place it on a flat and hard surface and wait for it to turn off. Step on to the scale and wait for the display to turn on. When it turns on, immediately step off and wait for the 0.0 reading to be displayed on the screen. Step on again and proceed with the measurements. We had downloaded the Beets BLU app on our iPad. With the app open, step on to the scale and it will record all your readings into the app. You need to initially enter some information in the app like your age, height etc. and this gives more accurate measurements. The scale and the app are very easy to set up. There is a 7-day and a 30-day progress tracker that is very useful. We have been impressed with the scale so far - it is well designed and sleek, the LCD screen displays the readings clearly, initial set up was easy and the app is useful especially if you are on a weight loss journey. 1. Clean the foot pads on the scales regularly to ensure good conductivity and accurate readings. 2. Weigh yourself at the same time of day and preferably with the same kind of clothing. 3. Use the scale as a benchmark and do not worry about minor weight fluctuations on a daily basis as it is normal. You can purchase this Beets BLU Bluetooth bathroom scale via Amazon. It is currently priced at £49.95, reduced from £69.95.